Then I started work on the window frames. I need to interior and exterior framing for each window. I cut most of the frames for one side (exterior only), and started cutting the acrylic (not too happy about the acrylic cutting, need to work out a better solution than the tool I’ve been using) for the “glass” panes. 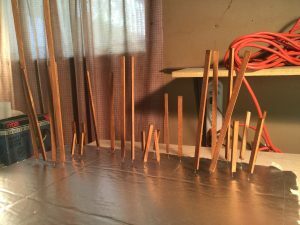 I ran out of the wood pieces I need to finish the windows. Hobby Lobby should have more stock by Thursday. I could order it but it takes longer than Thursday to get here. Not available on Amazon Prime! I also bought wood pieces so that I can start the stairs. Once the ceiling in the foyer is installed, including the can lights, I will probably start the stairs. 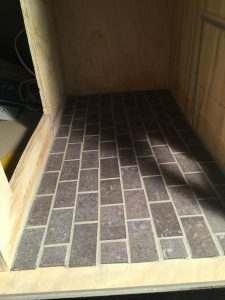 Yesterday I was able to spend enough time on the mini house to actually get the floor tile in the foyer laid! 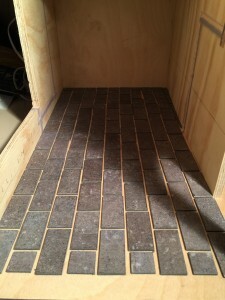 Lots of little hand cut “granite” tiles (actually vinyl tile) laid out in running bond pattern. I used a piece of the tile as a spacer for the grout lines. Now all I have to do is grout the flooring. I also spent some time “choosing appliances”, LOL! This means I went to an appliance website and found a fridge, stove and dishwasher that I like and saved photos, resizing them to “actual size”. I will use them to make my own appliances for my kitchen. I also spent some time researching proportions for cabinetry; standard heights, depths, widths, and looking at kitchen photos to pick out my design. I really want the proportions of the kitchen to be correct, as it will look more realistic. Proportion is very important in art, and miniaturization is an art. I watched videos of people building things out of foam core board, because I’ve pretty much decided this is what I am making my kitchen cabinetry out of. I may do the one wall of base cabinets and then see what I think. I might change my mind and use chunks of wood instead. We’ll see. Basically Marion Russek’s foam board kitchen inspired me. I’d like to see if I can pull off something similar though I am probably going to do a wood veneer facing on the cabinetry. 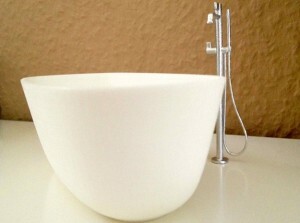 Hers is a beautiful, simple white. I really love her work! It is super realistic, and the design is awesome. I’m a fan, for sure! And I really love to see the process of someone putting minis together. It’s addictive. I’ve been continuing work on the electrical for the mini house. I’ve had to wait for a while as I ran out of electrical tape wire and I had to order more. It has arrived and I’ll probably finish the electrical tape wire installation tomorrow. 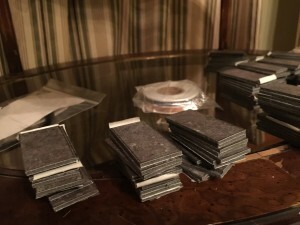 While waiting, I started cutting up one of my 12 x 24 granite look vinyl tiles into 1 inch by 2 inch “tiles” for the foyer floor. It will be glued in place and then grouted and I think it will look pretty real. I have some electrical tape wire which is being applied onto the subfloor of the house, so I can’t start installing the house flooring until the electrical tape wire is all done. I think I am pretty close to moving the house inside my own home (rather than the garage) for the finish work. But before I can do that, I have to fill in and sand the window openings and then install the window frames and plexiglass. I may also go ahead and install the fireplace stone before I bring the house inside. I ordered an electrical log fire set to put in the fireplace, so I have tape wire going behind the fireplace. I got some tiny LED lights for my “can lights” in the ceilings of the house. They will be in all rooms so there are a lot of them. I found a great website for these, and they have a great installation tutorial, see this link: modeltrainstoftware.com. I had to purchase eyelets for the “cans” elsewhere, however.